https://aristadevelopmentllc.com/wp-content/uploads/2019/02/money-2724235__480.jpg 480 865 Arista Development, LLC https://aristadevelopmentllc.com/wp-content/uploads/2018/01/Arista-Development-Logo.png Arista Development, LLC2019-02-12 17:54:402019-04-12 15:40:31How Much House Can I Afford? The seemingly infinite, ethereal pureness of a white gypsum sea; subterranean labyrinths of sparkling stalactites and stalagmites; and a fusion between the indigenous and the innovative inhabit the landscapes of New Mexico. 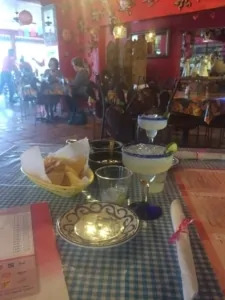 Located in one of the most culturally and geographically diverse areas of the country, Las Cruces, New Mexico is the gateway to treasures both within and outside of the Land of Enchantment. For those wanting to take up residence in the beautiful town, there are several sites to explore. The Arista team has picked our top day trip destinations, all less than three hours from Las Cruces. They are guaranteed to spirit you away––even if it’s just for the day. Owned and operated by the Mescalero Apache tribe, the Inn of the Mountain Gods Resort & Casino is the pinnacle at which tradition and luxury meet. Whether you prefer to take in the mountain air while gliding more than 7,000 feet above crystal blue waters on the Apache Eagle ZipRider, or puffing fine tobacco in the casino’s 1852 Treaty Room cigar lounge, Inn of the Mountain Gods makes for a legendary getaway. 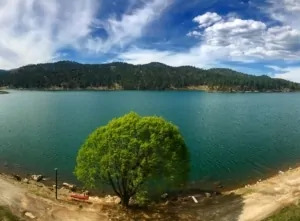 Southern New Mexico’s own alpine haven, the village of Ruidoso is known for seasonal outdoor activities, like horseback riding and skiing, as well as year-round hiking, camping, and cabin rentals. Enjoy metropolitan sophistication with a rustic twist when shopping on Sudderth Drive, and time-travel to the era of the “Great American Cowboy” with the Flying J Ranch chuck wagon dinner show. Follow in the footsteps of one of history’s most infamous outlaws when you trek from Las Cruces to San Elizario––home to the only jail that, according to local lore, Billy the Kid ever broke into. 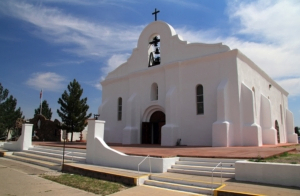 Characterized by traditional Spanish mission architecture, and rich with the culture of an emergent arts district, San Elizario makes the ideal stop for a day of on-foot exploration. 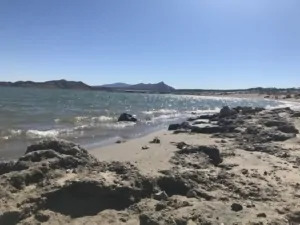 Southern New Mexico doesn’t typically conjure thoughts of water, but just seven miles north of Truth or Consequences, Elephant Butte is home to the state’s largest lake. 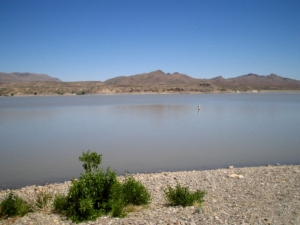 Constructed in the early 1900’s, this concrete dam is a desert oasis at the heart of the Elephant Butte National Register Historic District. 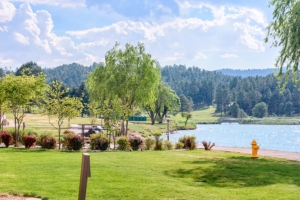 Nestled at the base of the Caballo Mountains, Caballo Lake offers 170 campsites, as well as RV utility hookups so you can comfortably spend the day boating, swimming, or simply enjoying the view from the shore. Caballo translated directly from Spanish is “horse” in English. The lake was named for the wild horses that roam the area, and true to its namesake, visitors can enjoy an equestrian experience in addition to the lake’s other outdoor activities. 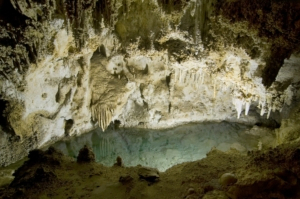 With both self-guided pathways and ranger-guided spelunking enterprises (for the more adventurous at heart), Carlsbad Caverns invites you to explore any of its more than 100 caves. After a day of navigating crystalline cave structures, guests can head to the amphitheater near the mouth of the cavern to watch hundreds of thousands of Brazilian free-tailed bats emerge in search of an insect dinner. 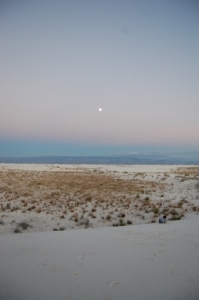 Less than an hour from Las Cruces, rare deposits of pure white gypsum sand paints one of the world’s most singular and sublime landscapes across 145,344 acres of the northern Chihuahuan Desert. Sled down 60-foot dunes, or stroll in the silver shadow of a full moon as you experience a destination sought by those around the globe, over in your own backyard. 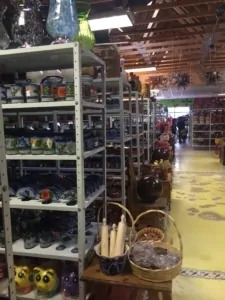 Just across the U.S.-Mexico border, The Pink Store is a colorful (literally) amalgam of handmade craftwork, furniture, knick-knacks, apparel, food––and yes, margaritas. This kaleidoscopic experience allows visitors to experience life through an international lens without stepping more than a few blocks out of the country. If you’re ready to live at the center of these amazing day trip destinations give Arista a call at 575-323-1118 or fill out our contact form.